I love fruity salsas, especially in the summer time! One of my favorite restaurants in Santa Fe has a delectable spicy mango salsa the I could just gobble up in minutes. These yummy turkey fillets are served with a pineapple jalapeno salsa that offers just the perfect amount of sweet and spicy. I love the combination of flavors and colors. I found this recipe on my favorite blog (Brown Eyed Baker). I attempted to make it a few weeks ago after our duathlon, but I seriously underestimated how much the cake would rise and nearly started the oven on fire. However, I am a determined baker, especially when chocolate and peanut butter are involved, and I decided to give it another try. My friends and I had a Saturday off together and we were craving a long hike.We had some snowfall in Santa Fe this week, but with a chance of thunderstorms in Pecos and Abiquiu we decided to stay in Santa Fe and embrace the unwelcomed late-season flakes. 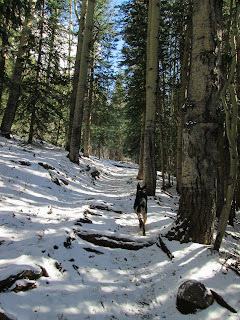 The trail to Santa Fe Baldy and Lake Katherine begins with a few uphill switchbacks followed by a long descent through spruce trees and aspens.This is my favorite section of the Winsor trail; even when leafless, the bark of the aspens is so beautiful and makes the trail feel sunny. The slushy snow made the hike more challenging, especially on the return trip, but thankfully it wasn’t deep in this section.The trail then crosses two creeks and leads to the Puerto Nambe clearing.This was about the halfway point, where we rested briefly and prepared for a 2.5 hour uphill to follow.